The NSpect family of Non-Destructive Inspection (NDI) Systems from Genesis Systems Group is making quite an impression. By combining ATI End Effectors, KUKA Robots, and vast engineering expertise, Genesis creates more efficient methods of NDI that encourage safety and increase quality. Genesis customers have confidence in NSpect Products as well–the company has integrated more than 30 NSpect Systems in the last five years. The purpose of NDI is to evaluate components and finished goods for structural integrity and fitness of use while keeping them intact. Traditionally, NDI inspection methods are performed by qualified operators and equipment; inspection data is gathered and interpreted by a trained analyst. Each NDI system’s configuration depends on the type of parts, as well as industry or customer-specific standards, which leads to a lot of variation from one application to another. Industries such as aerospace and medical manufacturing may require 100% inspection of finished parts and supporting documentation before shipping to the customer. High-volume manufacturing processes, like automotive assembly, necessitate repeatable and accurate testing protocols, which can be difficult to achieve with manual processes. Genesis streamlines NDI with ATI‘s Tool Changers, Collision Sensors, and custom-designed Utility Modules; thereby reducing manual labor requirements and process variability, and improving productivity. The brilliance of Genesis’ NSpect System lies in its versatility and functionality. Incorporating KUKA robots and ATI products ensures repeatable quality, high efficiency, and promotes safety. ATI’s Tool Changers save process time and increase throughput compared to changing tools by hand. It also reduces the amount of human interaction in the robot cell. Whitney Moon, Director of Advanced Material Processing at Genesis, says, “With any robotic project, you have to manage risks. It’s nice with the ATI Tool Changers we use because they are always at the bottom of the risk pool…we know they are going to work!” NSpect Products keep employees out of harm’s way and allow them to focus on what they do best–thinking critically and applying judgment, while allowing the equipment to do what it does best–working tirelessly to complete repetitive tasks with consistency and accuracy. Initially, Genesis imagined NSpect as a pre-engineered solution, but they soon recognized the diversity in their customer’s needs. Of all the NSpect Systems Genesis has developed so far, no two are identical. Fortunately, ATI’s standard products and custom design capabilities provide the flexibility needed to support the NSpect system’s ever-changing specifications. Many of Genesis’ customers need to pass utilities like air, water, or electrical signals to the process; all of which can be accommodated with ATI’s vast selection of Tool Changer Utility Modules. In fact, a particular client called upon Genesis and ATI to modify an existing ATI Tool Changer Utility Module for an Ultrasonic NSpect System. They needed to reduce electronic noise from poor grounding and servo motors. ATI incorporated ultrasonic connectors into a custom-designed utility module to support Genesis’ customer’s requirements. For companies like Genesis, reliable suppliers are essential to customer service. Genesis depends on ATI’s reputable standard products and custom engineering capabilities to support their diverse applications. With ATI as a partner, Genesis has the freedom to be flexible. The shared philosophy of holistic problem solving and superior service allows these two companies to work together seamlessly. More about Genesis Systems Group, LLC: Established in 1983, Genesis Systems Group is a globally recognized leader in robotic systems integration. 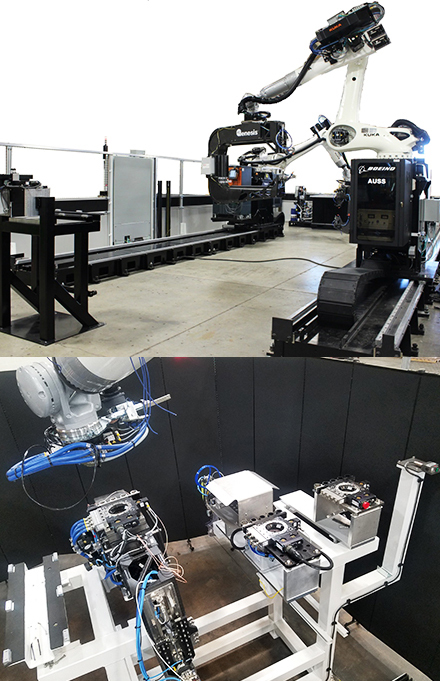 A RIA Certified Robot Integrator, as well as AS9100D and ISO 9001:2008 Certified, Genesis specializes in factory automation with robots for integrated robotic arc, spot and laser welding/cutting, non-destructive inspection, including robotic ultrasonic inspection of carbon fiber composites, adhesive application, material removal and material handling. 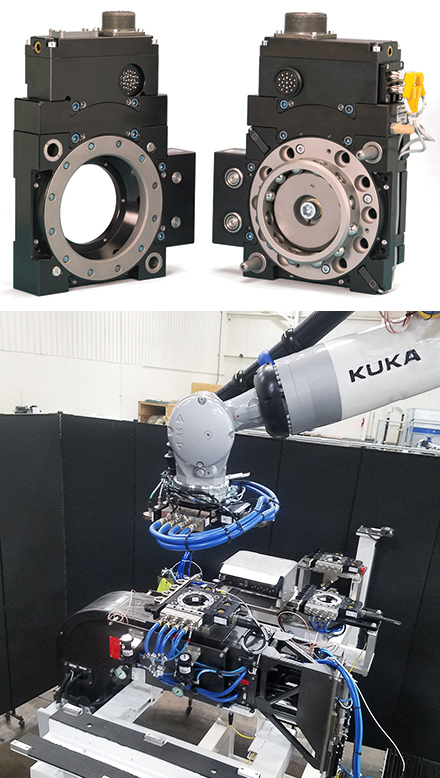 With the governing objective to help clients win the productivity race, in-house capabilities and expertise are centered on the design, manufacture, and implementation of integrated robot workcells. In addition, Genesis specializes in process related bundled services such as computer-aided engineering, (CAE) process simulation, lean manufacturing and other variation reduction techniques. Genesis has designed, engineered, manufactured and supported integrated robotic solutions for diverse industries including automotive, aerospace, agricultural, construction & forestry, primary metals, furniture, defense, energy and other general industries.